Today in our crochet blog we will teach in this post today how to make a beautiful crochet flower chain. This pattern is many simple and fast if you can follow the tutorial in video form, here you will learn with the step by step the whole process to make the pattern. I hope you enjoy this tutorial and that you like it clear. Because we always have to know new things, I had never seen and made one of these, I liked it so much that I left up two models for you here on the site, at a glance I know you will like it too, it's butterflies. To make this pattern we need few things like multi-colored yarn and a crochet hook, nothing more. These patterns spend little on being good for those who sell and we make the flower petals formed by a single crochet yarn. 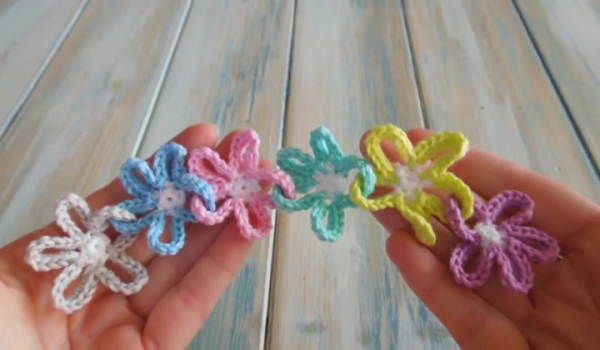 This pattern I leave for you is the crochet flower chain, an easy and quick pattern to make. I'm sure you'll be amazed at the result and you'll also love them all. This is a great way to use those threads that you do not use in time left over from other pattens, which we've all always saved. This crochet crochet flower chain crochet work is used to embellish other designs or use it alone by making a keychain, a bookmark, earrings, whatever the imagination tells you to. Best of all, we can make this pattern in 5 minutes so we can make more pieces in less time so we can give as a gift and make someone happy. This flower is made to adorn and brighten the place you put it with positive energy. To make this crochet flower you will use only a little bit of yarn, and a hook that is used for the yarn you use. Little material for such a beautiful and delicate thing. If you use the thicker yarn the result will be of a larger flower and if you use thinner yarn the result will be of a finer smaller flower. You can use this crochet flower as an applique in other projects or innovate a piece, or you can make them and to decorate the wall using as decoration of environment with different colors as I have seen and as I left in the photo for you to see. come into your mind and feel like doing with them and enjoy it is so simple, easy and fast. This beautiful crochet flower is so beautiful that I've seen it make a necklace with these crochet flowers. It has been trend in the internet because of its beauty and for being fast to do. Do you too and please everyone, below I left the video tutorial with the step by step how to do, also enjoy our page on facebook Xell Crafts.